The Asset Library is used to easily audit, store and repurpose all the content that has been created in Mintent. This is your universal truth to find all of your collateral and completed items. Leverage the library to repurpose content and extend this out to your marketing team. 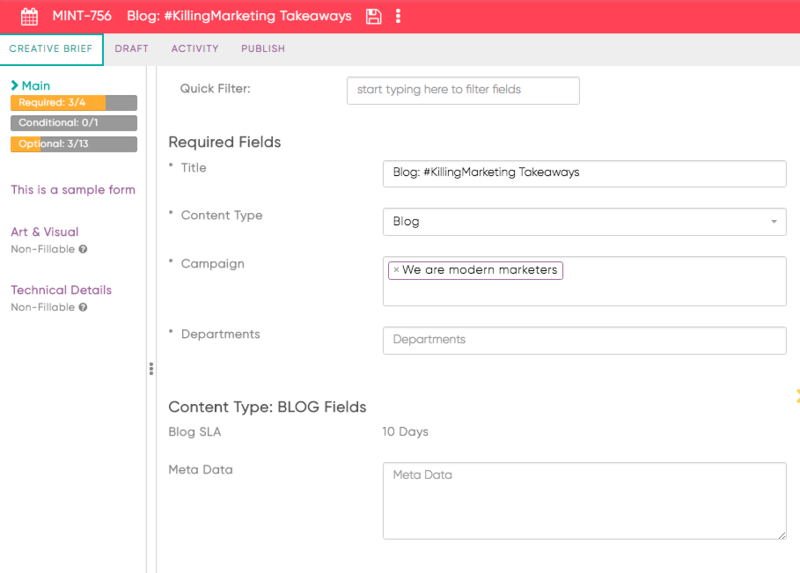 Once you've created content items, all items, their associated documents, and attributes (tags, mapped personas, etc.) can be found in the Asset Library. The library is organized by most recent attachment or completed item. On the top navigation click on Assets and head to Library. Existing Attachments and Completed Items will auto-populate. You can easily filter the Asset Library as you filter the calendar. Click on the Views on the top right and then drill down to specific topics and tags. The same way you would filter your calendar. You can search in the library as you search in the List View. 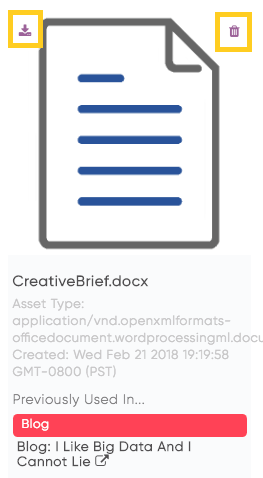 The search will find all items that relate to the creative brief. Clicking on the asset will take you to the content item brief. If you're looking to duplicate the content item to repurpose, use the Repeat this item from the actions menu to duplicate the existing asset. 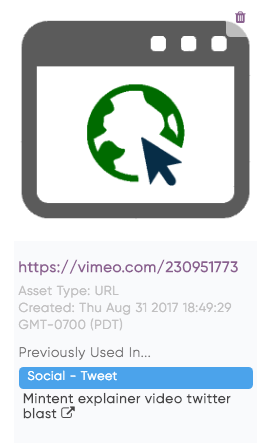 You can easily download an attachment by clicking on the top left (the download icon) and removing the attachment by clicking on the top right (the trash can icon). This will remove it from the content item. 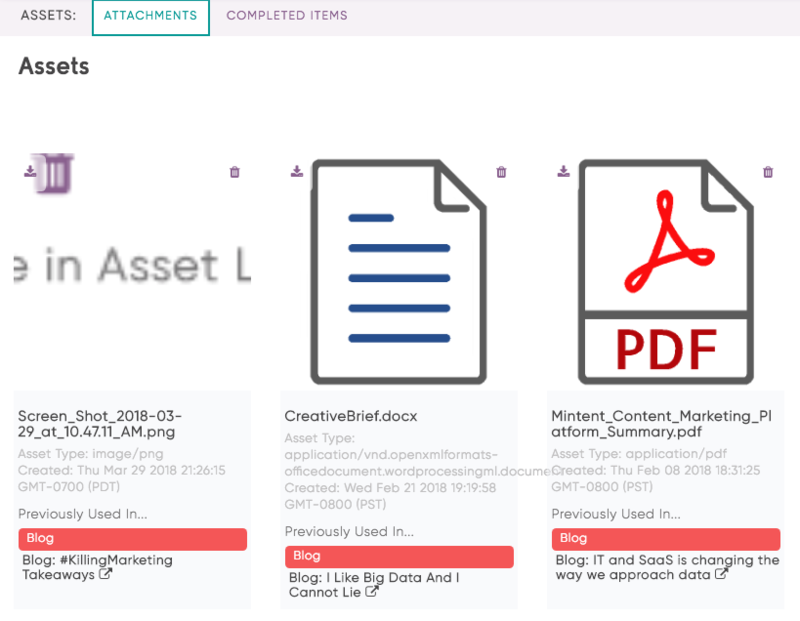 The attachments in the asset library are all of the attachments and links referenced to content items. This is to see all of your collateral that's been created in the platform. This is a great way to see every single item that's been created. 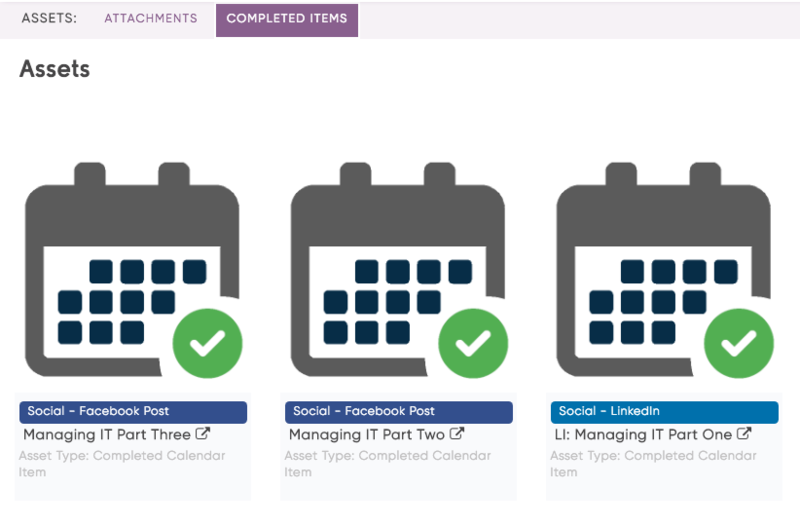 You can then leverage the filters to see how many items were created by project, campaign, or other strategic data.